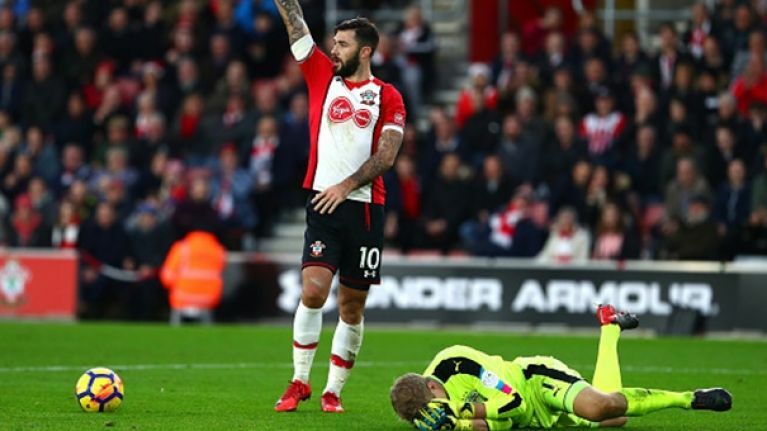 Southampton striker Charlie Austin has been charged with violent conduct following a clash with Huddersfield Town goalkeeper Jonas Lössl on Saturday. Austin collided with Lössl's face a clear second after the Dane corralled the ball in their 1-1 draw at St. Mary's Stadium. The England striker opened the scoring for the Saints in the first-half before Laurent Depoitre equalised in the second-half to earn a draw for the Terriers, but the talking point of the game was undoubtedly Austin's boot striking Lössl, an incident Huddersfield manager David Wagner felt was intentional. "You can't touch the opponent's goalkeeper," Wagned told Sky Sports in his post-match interview. "This was so easy and I will never say someone hurts someone on purpose but it looks like this would be the case in this situation. There are some people in this business who can judge this situation. "This incident was as ugly as he now looks. Merry Christmas to him. His wife will not be very happy when she meets him tonight but he looks good, he looks OK.
"He has to recover like the whole group and we will be ready for the Boxing Day game at home at the John Smith's Stadium." "He could've took his eye out..."
"They've got to see that the officials! "@GlennHoddle and @PaulInce react to Charlie Austin.